Reaching the fifth island is no small feat. However, as a reward, the game substitutes challenge for cameos. This is the first Taito theme island, and the theme is none other than Arkanoid. 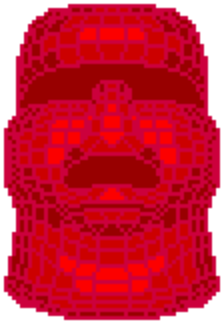 The island is named after the chief nemesis in Arkanoid, and all of the platforms are constructed out of Arkanoid bricks. 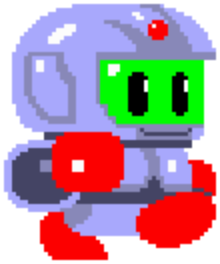 All of the enemies are the shapes that appear throughout Arkanoid, and even the music and sound effects are replaced with the "ping" and "pong" noise created by the ball and paddle. Interestingly, the first round of the island, Round 17, is the longest of the four, and the third round (19) is one of the shortest rounds in the game. These rotating cones move around the screen bouncing off surfaces and continuing on in another direction. The three colored balls bounce around the screen very much like the rotating cones. The pyramids drift through the screen, winding their way aimlessly, and occasionally bumping into platforms. The spinning squares tend to fly through the screen in one straight direction. The objects that shift back and forth from a cube to a spheres bounce along the platforms in Bubblun's direction. These balls remain spheres and they ricochet off the surface of every platform that they strike. Doh appears at the top of the screen and remains stationary throughout the entire fight. Every so often, he fires a stream of spinning squares in your direction, which you can attack with your rainbows if you're fast enough. There are no platforms in the room. If you have one particular powerup, the book that gives you wings, this fight can be incredibly easy. if you don't have it, this fight can be incredibly hard. If you have the wings, all you need to do is fly up to his height, and attack and crush him with rainbows. If you don't have the wings, you'll have to generate platforms for yourself out of rainbows, and then attack him while you're high enough. Eventually, the rainbows will disappear, or you may jump on them and knock them down, and you'll have to repeat the process. If at all possible, make sure you have wings before you reach Doh. One surefire way to do this is to find the silver door on the fourth island and collect the giant book which gives you the wings permanently. After passing through a theme island, you return to the rigorous and more demanding challenges that were present earlier. Robot Island may remind you quite a bit of Monster Island in that the enemies are fairly aggressive, and more determined to reach you. The quantity of enemies is a bit higher as well, as you'll rarely go far without seeing a couple appear. If you've managed to discover the giant special items behind the first four Silver Doors, you stand a very good chance against the tough opponents. Stick to the lessons you've learned in order to reach this stage in the game, and you should be able to survive. Bolts hop up and down like spiders and skeletons, trying to bounce in your direction. Detached robot heads float through the screen, trying to hunt you down. They fly a short distance, pause, and recalibrate their direction. Robots pace back and forth on their platforms, stopping to fire rockets across the screen. The wrenches spin around very quickly and ricochet off of every surface they encounter. There is little to distinguish between the two robot varieties, except that this version is a little faster and fires more frequently. At first, it seems like nuts simply roll off platforms and drop to the bottom. But once they're beneath you, they start to float back up to catch you. The Robot boss is like a more difficult version of the helicopter boss. He will float back and forth at one particular height, and then he will adjust to a new height before resuming his pacing. As he walks back and forth, he shoots rockets from his hands, and on occasion, he will release a spread of fire. Try to jump up to his level and attack him with rainbows while he is moving away from you. If he is low on the screen, try to jump up to the platforms and attack him from above by crushing him with rainbows. This is the last visible island. Large numbers of enemies will appear and do their best to prevent you from rising to the top of each round. If you managed to collect the giant feather from behind the silver door in the previous island, you will find the security of the constantly circling fairy very comforting. However, it can sometimes interfere with your efforts to collect the small diamonds in order. If you don't have the protection of a fairy, stay alert and remove the enemies before they become too big of a threat. If you're good enough to make it to Round 28, you'll be rewarded with a stage that contains plenty of 10,000 point money bags just lying around on platforms for you to collect. Silver knights hop around the screen, trying to bounce in your direction. They will bounce higher if you are above them. 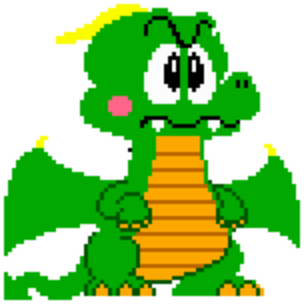 Dragons fly around the screen and through platforms. They pause during flight to breath fire at you. The cyclops walk back and forth along their platforms, and hurl maces across the screen. Ogres bounce around like silver knights, but they bounce high all of the time. The gold knights steadfastly guard particular platforms, and shoot orbs of energy from the tips of their swords. Slimes race along the tops of platforms until they reach the edge, when they begin to slowly drop down to the next platform. White ghosts bounce off of various platforms and continuously ricochet until they are defeated. The dragon boss that you encounter here is slow but direct. He will fly over to your current position, stop and breath a large jet of flame. Then he will resume his chase and repeat the process. If you have the wings when you arrive, this boss is fairly easy to beat. Lure him to one side of the screen, and attack him from the other side until he moves again. If you don't have the wings, you'll need to provide yourself with an escape route when he begins to fly toward you. Try to lure him to a location somewhere just above the ground so that when he stops, he won't be a threat to you, but you can be a threat to him. At this point, the game will end if you failed to collect all seven small diamonds in every island, thus failing to collect each of the seven giant diamonds. However, if you managed to collect all seven giant diamonds, three more islands will rise out of the water, and you will be permitted to advance to Magical Island! This page was last edited on 12 February 2015, at 01:03.